You can use your mobile device to access this tour on site, or download the printable version from the menu on the right. This tour begins at Burston Reserve, a small park located between Parliament Place and Macarthur Street at the eastern edge of the central city. At Burston Reserve, make your way to the top corner of the park, where Macarthur Street meets Parliament Place. This is Stop 1. There are many road crossings on this tour. Please cross only at pedestrian crossing points. There are no designated cycle paths on this route, so riders should be confident cycling on the road. At Stop 1 you can see the three raingarden tree pits within the pavement. These trees are younger than most of the other trees in the reserve. 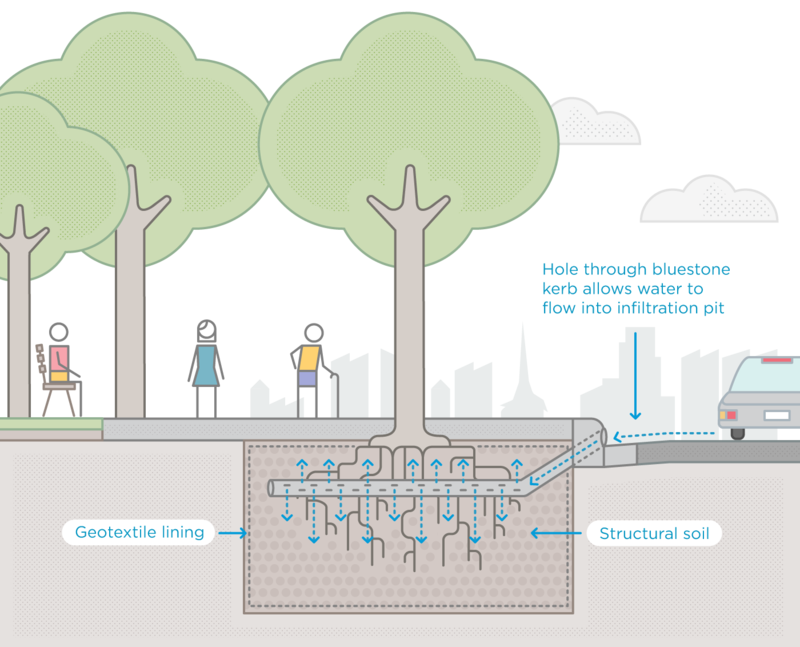 How do the raingarden tree pits work? 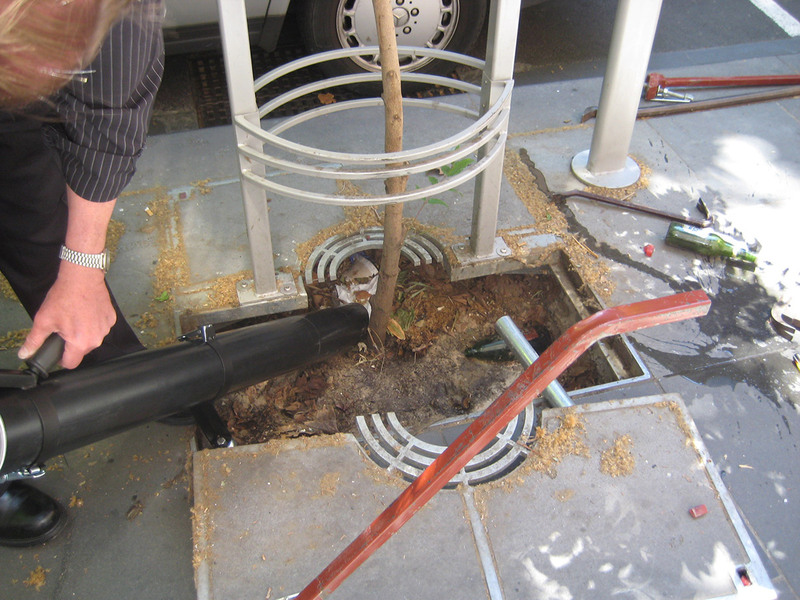 The raingarden tree pits are set into the kerb along Macarthur Street. They intercept and clean the water before it goes into the drain. To move on to the next stop walk along the Macarthur Street edge of Burtson Reserve until you have reached the green and yellow historic tram stop, where the trees in the footpath are fully grown. This is Stop 2. You are standing on the footpath along Macarthur Street, looking at the large trees within the footpath. 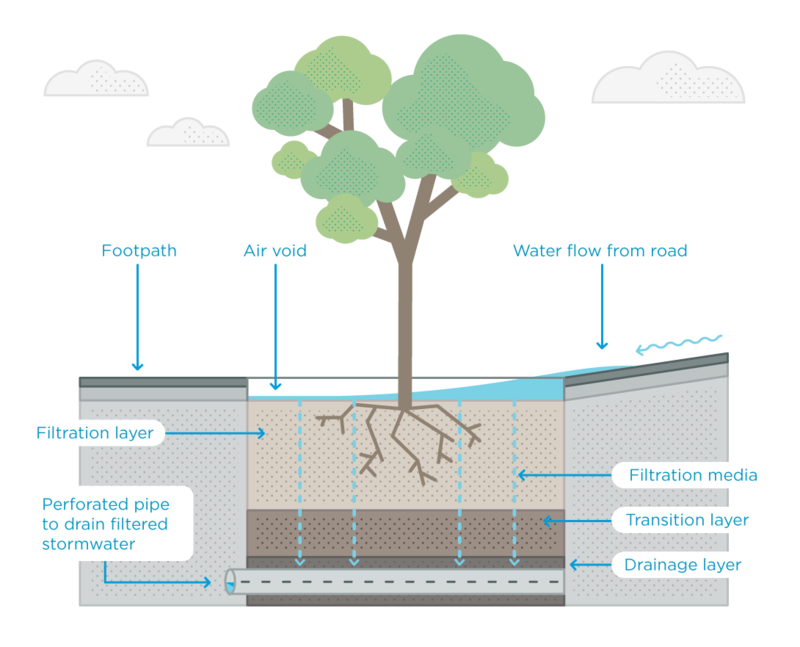 Underneath the footpath there are two infiltration pits that allow water runoff from the road to access the root systems of these trees. The pits have been installed between the trees. Although you can’t see the pits, you might notice the grated inlets in the kerb that allow water to flow into the pit. How do the infiltration pits work? These pits capture water runoff from the road, irrigating the trees on either side, cleaning the water and reducing stormwater runoff volumes. A slotted drainage pipe runs through the centre of the pit, connecting to a drainage hole in the gutter. 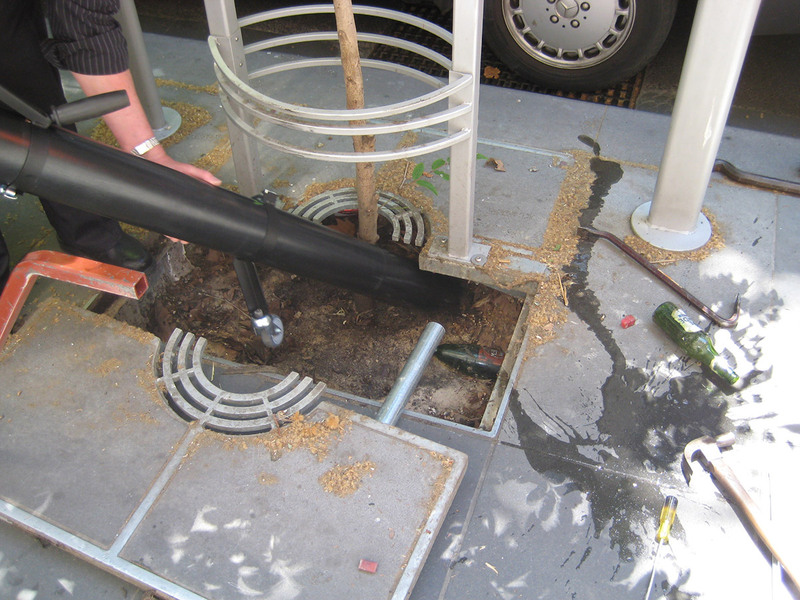 This allows water to flow from the gutter into the pit, where it gradually soaks out into the tree root systems. To learn more about the Water Sensitive Urban Design at Burston Resrve, read the full case study. To move on to Stop 3, cross the road at the pedestrian crossing and make your way across Gordon Reserve towards Little Collins Street. Cross Spring Street at the pedestrian Crossing and walk about 20 metres down Little Collins Street on the left hand side until you reach the tree with the plaque beside it. This is Stop 3. You are standing beside a raingarden tree pit. 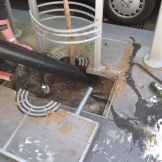 This raingarden tree pit work in the same way as the one is Burston Reserve, however it is covered with a bluestone plate for pedestrian safety and to protect the tree. 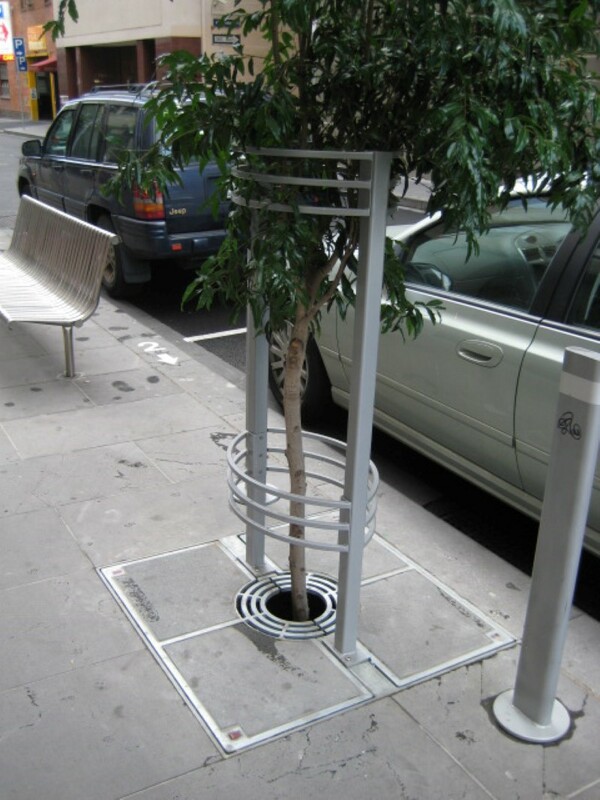 As you walk down Little Collins Street to the next stop, take notice of the many raingarden tree pits along the way. To make your way to the next stop, continue down Little Collins Street. When you reach Swanston Street and the Melbourne Town hall, turn left. Walk to the next intersection and turn right into Collins Street. Walk along Collins Street for one block and cross over Elizabeth Street. Continue along Collins Street for about 50 metres until you notice the checkerboard pattern in the bluestone paving between the trees. This is Stop 4. You are standing on Collins Street, looking at the strip of checkerboard-patterned bluestone pavement that runs between the trees. This is permeable bluestone pavement. Bluestone paving is a defining element of Melbourne’s character – you will have seen much of it on the tour so far. 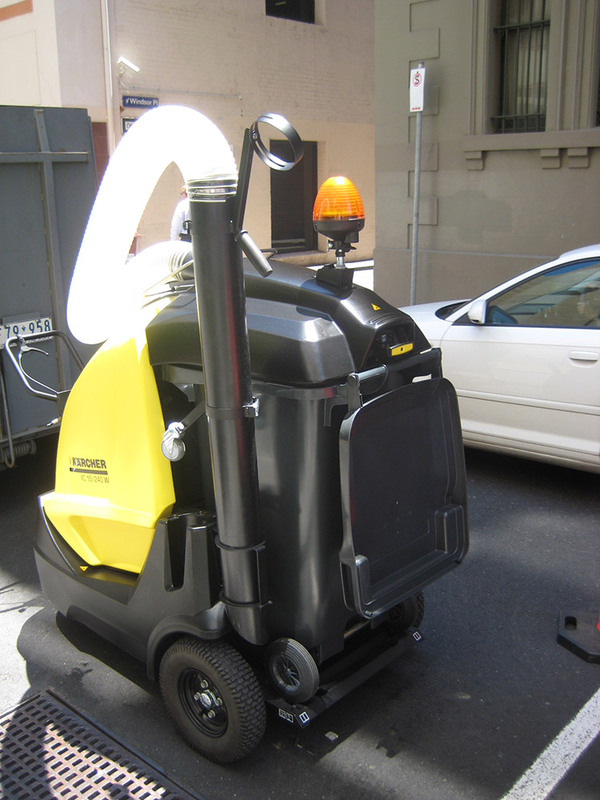 It is a durable and long-lasting surface that improves footpath accessibility, especially for disabled community members. 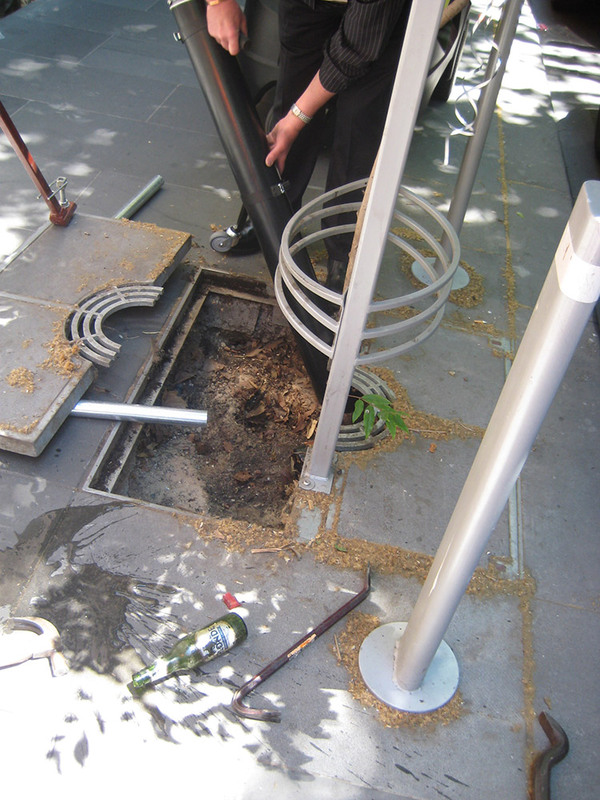 Here in Collins Street, we trialled a new approach to installing permeable bluestone, that allows rainwater to soak down between the pavers. 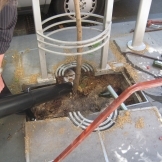 This improves soil moisture and waters the adjacent trees. 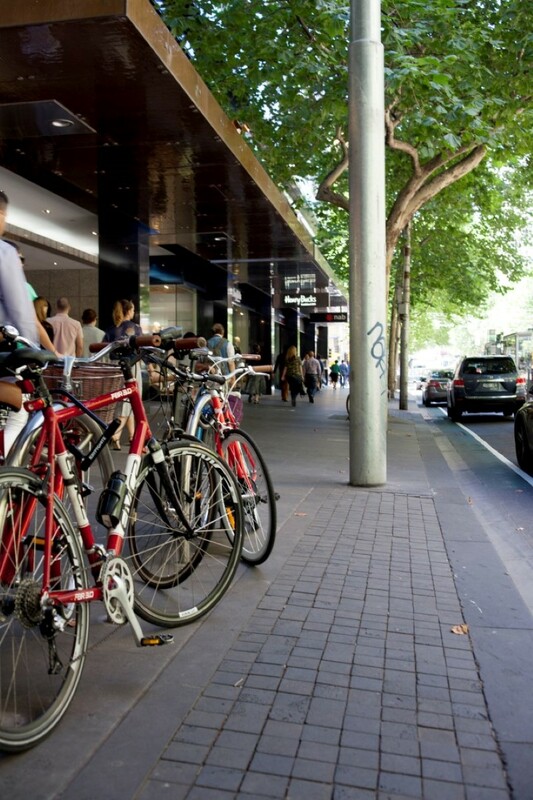 Since the successful Collins Street trial, we have installed permeable bluestone paving in several locations across the central city, as you will see on your way to the next stop. 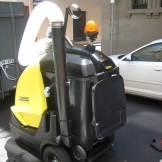 How does the permeable bluestone pavement work? To learn more about the permeable bluestone pavement, read the full case study. 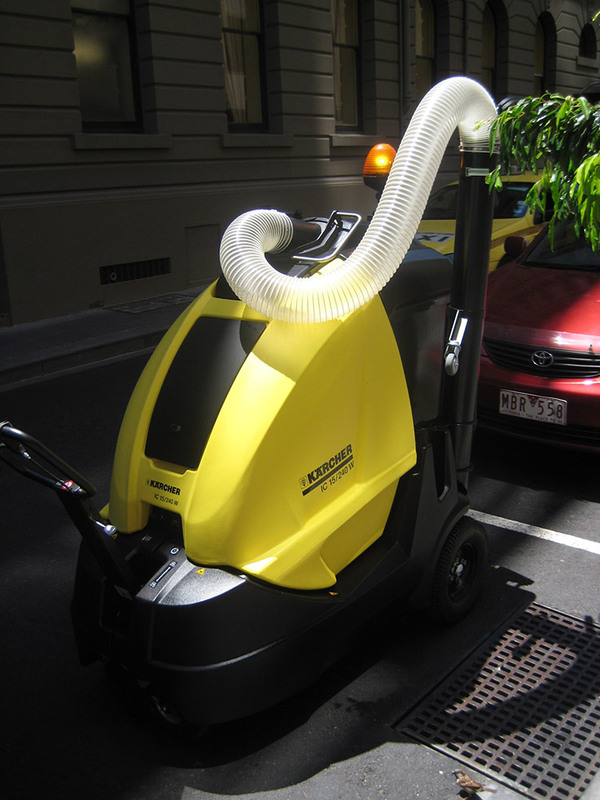 To move on to the next stop, continue along Collins Street until you reach King Street. At King Street, turn right and then turn left into Little Collins Street. 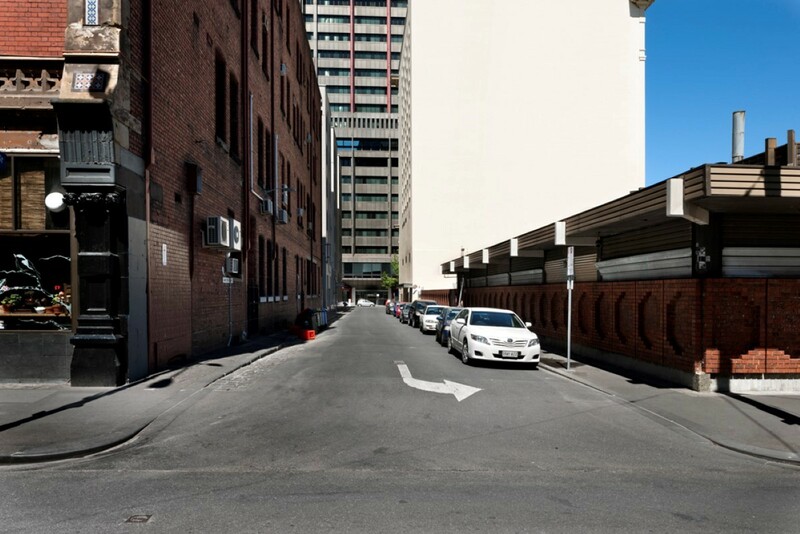 Walk along Little Collins Street until you reach Godfrey Street, on the right hand side. This is Stop 5. 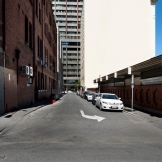 You are standing at the corner of Godfrey Street and Little Collins Street, looking down Godfrey Street. On hot days, Melbourne’s urban area can be up to four degrees hotter than surrounding areas, as a result of the urban heat island effect. Excessive temperatures pose health risks to the community and environment, and impact on business productivity. Thermal imagery taken in 2010 shows Godfrey Street is a hot spot. 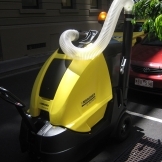 Heat is retained in the road, pavement and surrounding buildings. Rainwater is now collected from the roof of a large building (the Donkey Wheel House heritage building on the right) and diverted into a trench of structural cells beneath the footpath. This allows rainwater to passively irrigate the new trees in the trench, you can see the young trees in the footpath ahead. Some rainwater is also diverted to a new garden bed at the southern end of the street. A green façade was also included in the streetscape design. It will grow up the side of the Donkey Wheel House building from a garden bed at the base of the wall (near the Bourke Street intersection). Once fully grown, the green façade will provide additional cooling in the street. How does the passive irrigation system work? The Donkey Wheel House is the large heritage building that occupies approximately half of the eastern street frontage along Godfrey Street. Rainwater is captured on the roof of the building and flows into five downpipes, spaced along the façade. 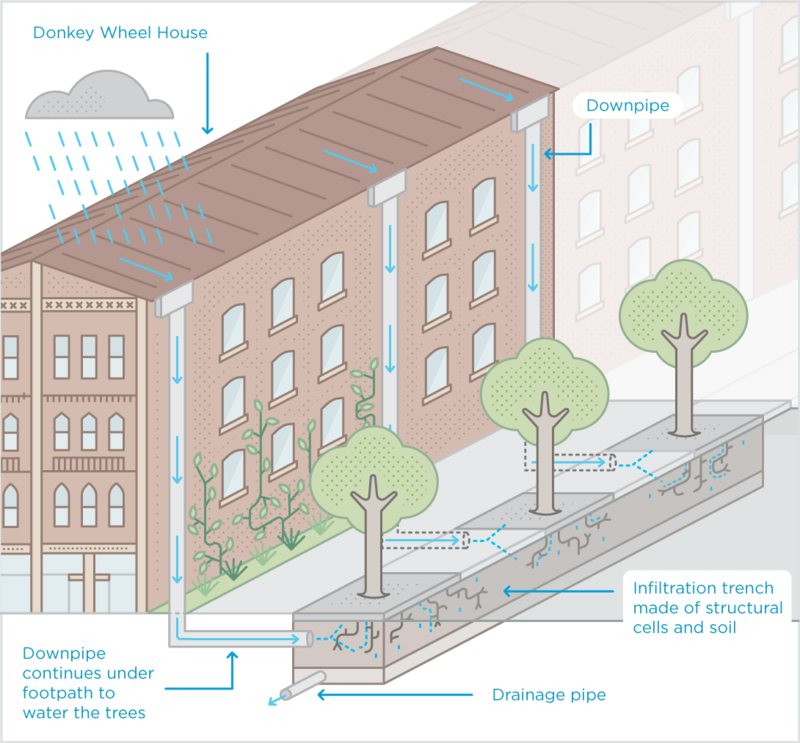 The new passive irrigation system redirects rainwater from these existing downpipes to the trees and garden in the street. We have redirected three of the downpipes into an underground channel of structural soil and structural cells beneath the pavement. Runoff from the footpath is also directed into the channel via the grill in the pavement. 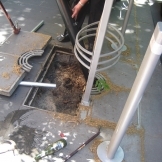 At the southern end of Godfrey Street (the Lt Collins Street intersection), stormwater is diverted from two downpipes on Donkey Wheel House into a roadside gutter that flows into a garden bed. This provides passive irrigation to the shrubs and trees in the garden bed. It also removes pollution from the water. In heavy rain, excess water is able to flow out from the garden bed and into the stormwater drain. This prevents flooding. To move on to the next stop, turn right onto Bourke Street and continue to the next intersection. Turn left onto King Street and continue to La Trobe Street. At La Trobe Street, cross the intersection to Flagstaff Gardens. This is Stop 6. 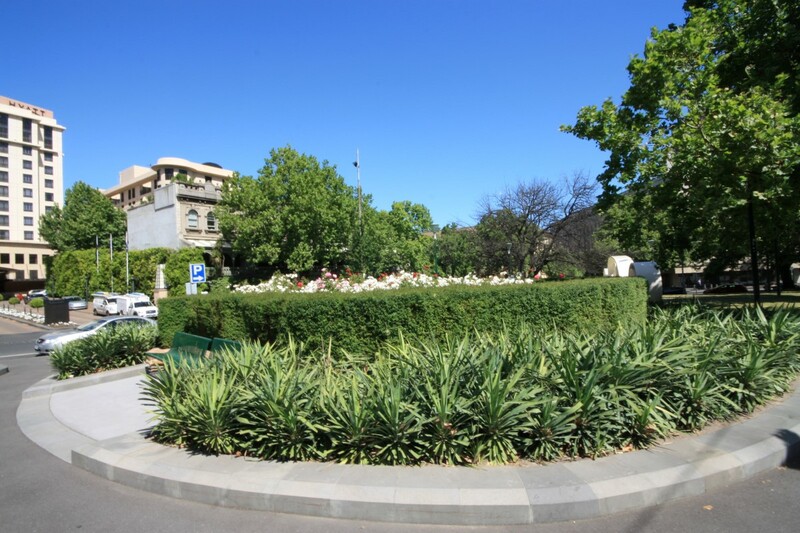 You are standing at the corner of King Street and La Trobe Street, on the edge of Flagstaff Gardens. 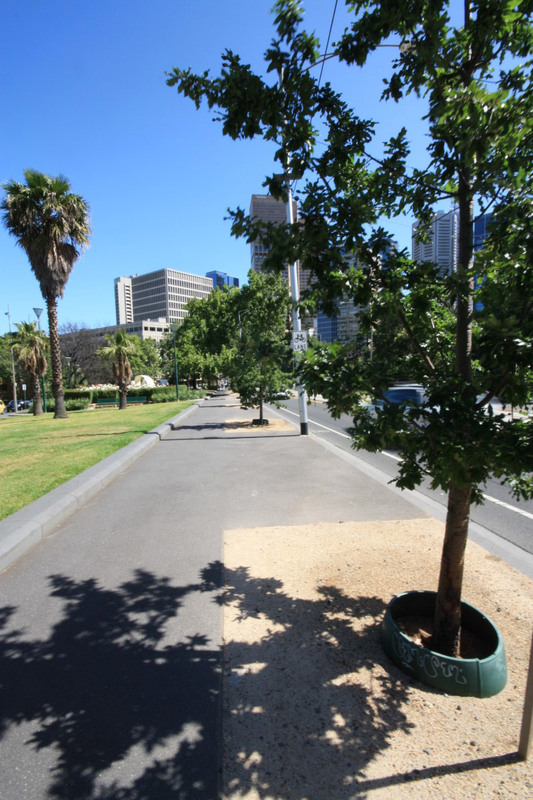 You can walk along the edge of the gardens, following La Trobe Street, observing the separated bike lane to the right. 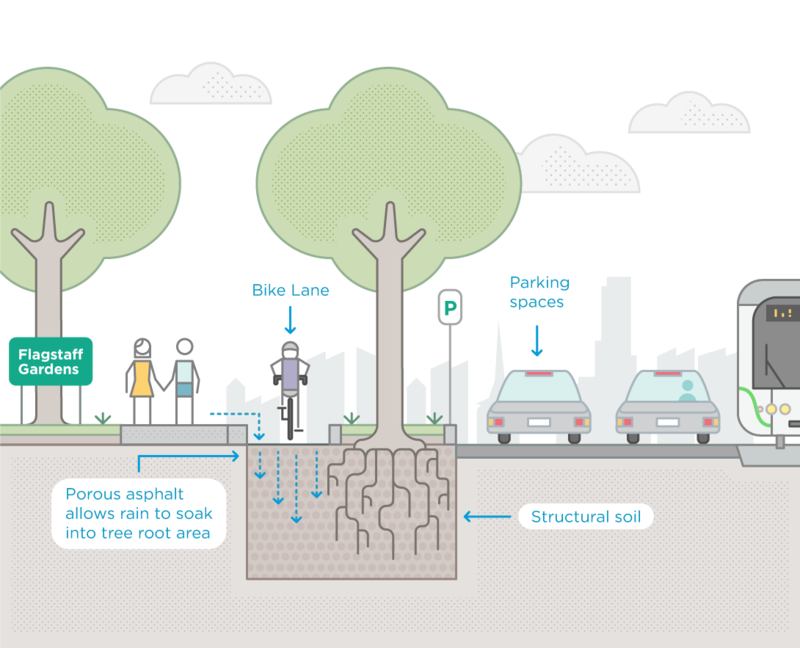 How does the permeable bike lane work?